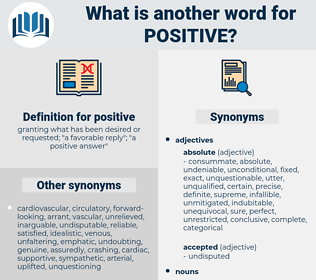 What is another word for positive? granting what has been desired or requested; " a favorable reply"; " a positive answer"
affirmative, supportive, propitious, favourable, favorable. encouraging, welcome, seropositive, pro-active, upbeat, advantageous, productive, positive-sum, useful, gas-positive, enthusiastic, effective, virtuous, sympathetic, helpful, benign, meaningful, excellent, commendable, fruitful, gratifying, energetic, favourably, promising, conclusive, assertive, substantive, healthy, salutary, worthwhile, correct, significant, right, strong, auspicious, nice, permissive, progressive, pleasant, fortunate, responsive, intensive, praiseworthy, definitive, bright, valuable, practical, important, interesting, appreciative, receptive, happy, enterprising, categorical, pleased, active, desirable, hopeful, pleasing, attractive, definite, tangible, heartening, improvements, convinced, rewarding, preferential, confident, certain, valid, improved. POS, successes, Gains, pros, banners, benefits, improvements. welcomed, Helped, Had, Was, Were. supports, represents, welcomes, Has, regards, pleases, Does, benefits. counterfeit, unreal, pretended, imaginary, fictitious, legendary, false. confused, nervous, hesitant, doubting, distrustful, fearful, dismayed. uncategorical, tentative, ambiguous, implied, equivocal, vague, questionable, qualified. disadvantageous, unsure, indefinite, doubtful, uncertain, unhelpful. contingent, Contradictable, submissive, disapproving, critical, constitutional, carping, lenient, caviling, humble, disputable, informal, complaisant, accountable, gentle, speculative, inconclusive, deniable, overcritical, responsible, inappreciative, indecisive, minus, faultfinding, yielding, disputed, wavering, mild, compliant, moot, uncharged, timid, academic, unflattering, unassuming, ductile, meek, incertain, hypercritical, docile, theoretical, captious, answerable, vacillating, controversial, gram-negative, lowly, refutable, iffy, hypothetical, unappreciative. Here the pursuers found the first positive indication they were on the right track. I know I put them back last night - I'm positive.